Normally the idea of chocolate flavored beer, alcohol, anything freaks me out... but after reading the review of this here "Sweet Baby Jesus" beer, I'm all about trying it. 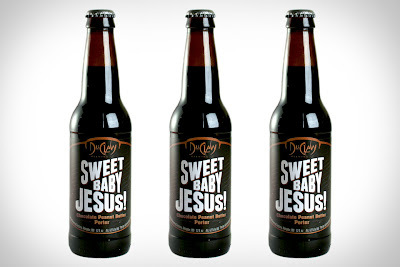 I mean... it's called SWEET BABY JESUS, if that's not enough of a reason. Apparently it's a fantastic combination of flavors that makes your tongue think it's drinking a Reese's peanut butter cup. The best part: It's brewed in Maryland! That's like... practically Virginia, and probably means it's easy to find, right!? Pretty much, yes! Just have to find a Du Claw location, and there are a few in Maryland, including BWI airport! Who's ready for a road trip?! cuz I'm already in the car and ready to go try it out.